Football's world governing body, Fifa, is right to impose a 14-month transfer ban on Spanish champions Barcelona, says Arsenal boss Arsene Wenger. The Catalan club are appealing against the sanction for breaking rules on signing international players under 18. 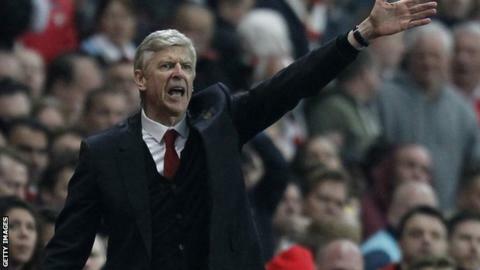 "They were banned because they have not respected the rules," said Wenger. But the Frenchman believes the Fifa regulations, aimed to protect young players and prevent child trafficking in football, need to be changed. Barcelona cannot buy players in the next two transfer windows and were also fined 450,000 Swiss Francs (£305,000). The Spanish Football Federation (RFEF) was also sanctioned for the same breaches, receiving a fine of 500,000 Swiss Francs (£340,000). "The rule is quite simple, you cannot move the players before the age of 16 unless their parents move for professional reasons, so that of course creates a bit of a debate - do the parents move for professional reasons or not?" said Wenger. Arsenal exploited Fifa rules to sign teenage Barcelona midfielder Cesc Fabregas in 2003, with Manchester United doing the same to sign defender Gerard Pique a year later. "In this case, Fifa has judged the parents moved for football reasons and that is why they were banned because they have not respected the rules." He added: "The rules need to be changed, because there is more competition now to get the young players, and you will always be in a debate as to why did the parents move? "There is more money in the game, so the parents will be tempted to give their young boys a chance to have a great career." It is not the first time that Wenger and Barcelona have disagreed over the transfer of young players. Arsenal signed a then 16-year-old Cesc Fabregas from Barcelona in 2003 after exploiting a loophole where Spanish clubs, under their country's law, could not sign players until they were 18. Under European Union and Fifa regulations, English clubs could sign them at 16. Barcelona criticised the move and were later awarded £1m compensation. Spain midfielder Fabregas, now 26, rejoined the Catalan club in a £35m deal in August 2011. Teenage Spanish players Fran Merida, Ignasi Miquel and Jon Toral have also joined Arsenal after leaving Barcelona's famed La Masia youth academy in recent years.